The Hockey Show returns to the airwaves tonight at 6:00pm CT on 101.5 UMFM. We have a pretty big show lined-up as we delve into the discussion of re-alignment and how it will affect certain teams. We'll also chat about the recent roadtrip of the Jets and how that road success has people in Winnipeg thinking playoffs. We'll recap the Manitoba Bisons men's hockey team's weekend as they battled the University of Saskatchewan Huskies with a berth to the Canada West Final on the line. Finally, we'll look at the new look for that the Canadian Women's National Team will wear on April 2 against the Americans. I wrote a fairly harsh article about Hockey Canada's partnership with LIVESTRONG in terms of how there may be a backlash against Hockey Canada for partnering with the organization had Lance Armstrong as the face for their work. The Armstrong scandal - the lies, the accusations, the lawsuits - isn't going away as he's essentially regarded as the biggest cheat that the sports world has ever known. That's a pretty lofty accomplishment when you consider the Black Sox scandal, the steroid/performance-enhancing drug era in baseball, and the multiple track-and-field doping scandals. My better half was outraged when we were discussing this new Hockey Canada partnership. She wanted to know the rationale behind associating Hockey Canada's good name with Lance Armstrong. I tried to explain to her that Armstrong was no longer involved, but she - like the vast majority of the public, I suspect - do not separate Armstrong from LIVESTRONG because of how tightly-interwoven those two names are. In any case, I'm still not happy about Hockey Canada giving up Canada's national identity in exchange for being a Nike/LIVESTRONG billboard. We'll talk about this tonight, so join us at 6:00pm CT on 101.5 UMFM for The Hockey Show! If you'd like to add to the discussion, we'll be taking calls at (204) 269-UMFM (8636), emails at HockeyShowUMFM@shaw.ca, and tweets at @TeebzHBIC! Join us for some hockey chatter tonight! I was going to talk about the NHL's realignment plan today when another piece of news floated across my desk today. 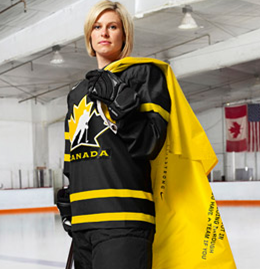 It would appear that Tessa Bonhomme has been traded to a Boston or Pittsburgh team based on the image to the left, but the truth is that Hockey Canada will be wearing the uniform depicted for their opening game against Team USA on April 2 at the 2013 IIHF Ice Hockey Women's World Championship. Canada has worn some different colors in the past - green at the World Juniors and pink at the Women's World Championships - but Canada has yet to wear this bright shade of yellow seen here. So what gives? What reason does Canada have for sporting black and yellow? Hockey Canada and Team Canada have had a strong partnership with Nike for nearly 20 years. In that time we have seen how their ongoing commitment to the LIVESTRONG Foundation has made a real and undeniable difference in the fight against cancer. As a team, we are extremely proud be a part of this opportunity and we look forward to wearing the jersey with pride and supporting this great cause. Look, I'm all for supporting the cause and hopefully finding a cure for cancer one day, but why does Hockey Canada need to wear LIVESTRONG colours to do so? Nike is a partner with LIVESTRONG as well, so this move by Hockey Canada feels very much like the tail wagging the dog as Hockey Canada is outfitted by Nike. Personally, I'm not buying all the goodwill and rhetoric coming out of the Hockey Canada camp. They may mean what they say, but as a proud Canadian, I don't want my country's national team being a billboard for the wishes of Nike and a somewhat-disgraced charity. Further to this, Nike and LIVESTRONG touted their work in investing money and resources in Canadian organizations and resources that help survivors and research cancer-fighting drugs and techniques to the tune of $620,000. The problem I see with this is that an organization like "Nike has helped raise more than $100 million for the LIVESTRONG Foundation, which has brought in nearly $500 million to battle cancer since its inception 16 years ago". Doing the math, $620,000 of $500 million is a handsome 0.124% of all the monies raised by LIVESTRONG. Well done, Nike and LIVESTRONG. Solid work there in investing just over a tenth of one-percent of all money raised in Canadian cancer-fighting effort! Excuse the sarcasm, of course. But aside from all the self-serving ideology that Nike and LIVESTRONG are doing, is Hockey Canada's partnering with a somewhat-disgraced charitable organization the right thing to be doing at this stage of the game? Look, I'm not against what LIVESTRONG does in terms of fighting cancer and giving people hope, but the very polarizing scandal of founder Lance Armstrong is still very fresh in the eyes of the sporting world, and while he's attempted to distance himself from the organization by stepping away, the fact remains that people still associate him with the LIVESTRONG Foundation because of his long-time association with it. Will there be a backlash towards Hockey Canada from its fans because of the Lance Armstrong association with LIVESTRONG considering how loathed Lance Armstrong seems to be in today's sporting world? We at the LIVESTRONG Foundation are disappointed by the news that Lance Armstrong misled people during and after his cycling career, including us. Earlier this week, Lance apologized to our staff and we accepted his apology in order to move on and chart a strong, independent course. We look forward to devoting our full energy to our mission of helping people not only fight and survive cancer, but also thrive in life after cancer. Strong words from the organization that was founded in Lance Armstrong's name and used his image to promote its message. It's this association, though, that is etched into the mind of the unforgiving public when it comes to anything associated with Lance Armstrong, and the fact that he lied to millions may result in this merchandise and marketing campaign to underachieve in reaching its goal. If there is one thing that bothered me early on, it's the fact that the uniform itself is black. I am sick of seeing Canadian teams wear black uniforms. Look, I get that it's one of Hockey Canada's colours, but WHY FOR THE LOVE OF ALL THINGS GOOD WOULD A CANADIAN TEAM WEAR BLACK?!? Of course, it dawned on me that the yellow and black look that Team Canada is wearing, including the Hockey Canada logo itself, is the colour scheme of the LIVESTRONG Foundation. However, the LIVESTRONG Foundation uses black-on-yellow, not the opposite. Why can Canada not wear a yellow uniform? After all, they've worn green, they've worn pink, and the men even wore the old Winnipeg Falcons colors at the World Cup of Hockey. 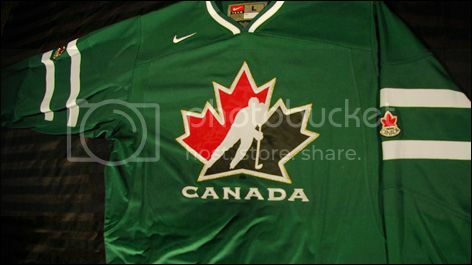 Why does Canada have to wear black if they are only wearing this uniform for one game against the Americans? It's not like they're playing Sweden in yellow, so why must Canada wear black? Honestly, the black uniform in hockey has been played out. It's no longer effective. Colour is better, and this uniform honestly gets lost amongst the vast number of black hockey uniforms that have sprung up over the last two decades in hockey. There's nothing unique to make it stand out or memorable other than NOT BEING CANADIAN COLOURS, and it seems like this is a nothing more than a cash-grab by the Hockey Canada-Nike-LIVESTRONG triumverate to help the latter two companies generate a little extra cash for their cause. I'll gladly support Nike and LIVESTRONG through a Hockey Canada donation in purchasing their wares, but don't sell-out Hockey Canada's look or Canada's colours to make a few extra bucks. That's utter garbage. I'm not holding the players responsible for this manifestation of corporate buffoonery because they wear what they are told to wear. I'll still cheer for the women when they take the ice on April 2 against the Americans because they are playing for Canada and not for Nike and LIVESTRONG despite the strong presence of those two organization on the uniforms. I will not, however, purchase any black-and-yellow Canada gear with my own hard-earned money because I disagree with the business practice of putting merchandise dollars before one's own national pride. Hockey Canada is the governing body of hockey in Canada, and that should not be available to be bought and sold. As an asterisk, I would proudly purchase Hockey Canada wares with a LIVESTRONG patch or emblem on them because that makes sense, but Nike and LIVESTRONG have removed the Canadian red-and-white identity from the Canadian uniform and from the Hockey Canada logo. That's blasphemy as far as I'm concerned, and no person or corporation should ever be allowed to do that if one believes in any sort of national pride. As the old saying goes, "the path to hell is lined with good intentions". Welcome to a prime example of hockey purgatory. It's been a busy few days lately as the hockey world has seen some interesting changes and some interesting things happen. While I'd like to say that this will be a positive look at a few things, I'm going to preface this article by saying that you'll find some good and some bad from the hockey world. There have been some jerseys rolled out by a few teams that we'll give the thumbs-up or thumbs-down to, there will be a tweet that was posted that I found to be incredibly irrelevant in the grand scheme of things, and we'll talk about the trades that happened today. It'll be a busy bit of chatter on HBIC today, but we'll have some fun. Let's get to it. I appreciate that some NHL teams tweet out statistics and milestones that are significant achievements made by players. While some are eye-opening, there are some that literally are just useless information. Case in point? The Colorado Avalanche posted this tweet today regarding a milestone that Milan Hejduk is approaching. Hejduk is one powerplay goal shy in his career for a share of 51st all-time in playoff goals? Are you kidding me? Look, it's an excellent statistic to track in a team setting, but posting the all-time standing of a guy when he isn't even on the radar of most career powerplay goals is dumb. Hejduk is a great player and I've admired and respected his game for a long time, but this statistic makes it seem like all of his great work is pretty inconsequential. Hejduk deserves more respect than that, especially from the Avalanche where he's done his share of excellent work. 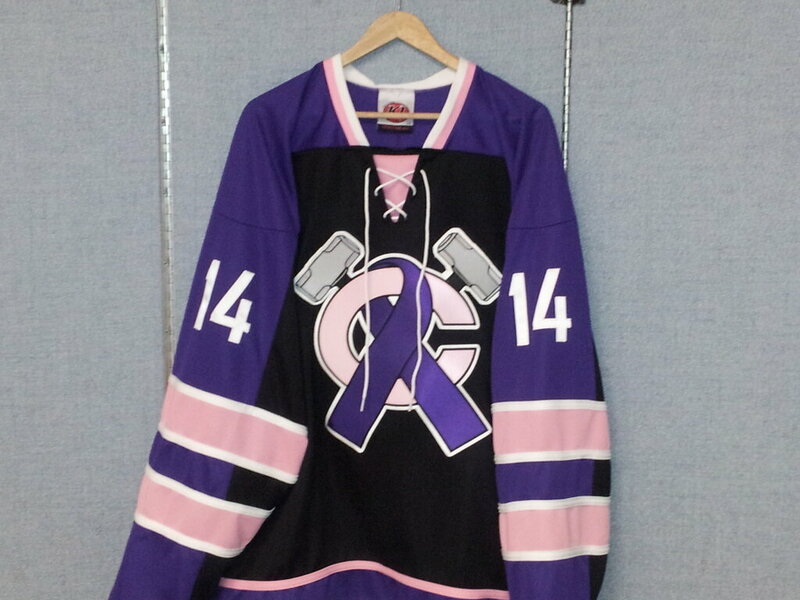 The USHL's Chicago Steel showed their support for cancer research by donning these uniforms on February 15 and 16 as they battled the Cedar Rapids RoughRiders and the Dubuque Fighting Saints over the weekend. 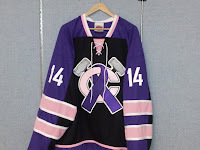 It was good news for the Steel as they took both games in their cancer-support jerseys as they beat Cedar Rapids 4-1 and then dropped Dubuque 7-3. Overall, I don't have an issue with these uniforms. They're different, and they aren't overly garish in terms of their design. Thumbs-up from me on these charity uniforms. What say you? If you need someone awesome to follow on Twitter, might I suggest you follow Dana Heinze, the equipment manager for the Pittsburgh Penguins. Heinze posts pictures of everything he's involved with, making his Twitter feed one of the best that I've come across when it comes to images. 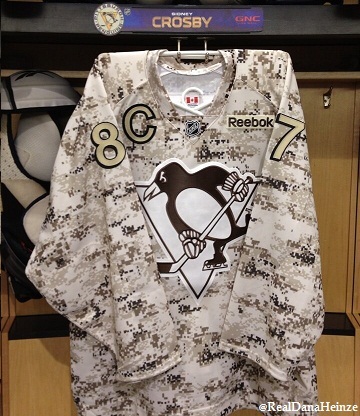 For example, here is the tag from one of the recent military warm-up uniforms worn by the Penguins. Notice the Penguins logo with the stars-and-stripes? That's pretty awesome. 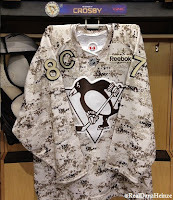 But he also notes that the Penguins logo on the military warm-up jerseys this season is brown to match the military uniform as opposed to being the normal black-and-yellow logo like it was last year. Honestly, Dana Heinze's Twitter feed is a "must-follow" for all hockey fans with all the images he posts. Find him at @RealDanaHeinze! Simon Gagne, who helped the Los Angeles Kings capture the Stanley Cup last season, is going back to his original team as he was dealt to the Philadelphia Flyers today. It seemed as though Gagne never really fit into Darryl Sutter's plans this season, so he'll be back in Philly orange-and-black for the remainder of this season. For Los Angeles, this opens some cap space - something they need - and it allows one of their younger players to step in and get some NHL minutes. I'm not sure why Philly thought they needed Gagne, but he may be able to step in and take Matt Read's minutes with Read out for another five weeks or so. I saw a couple of people mention that this trade could set up a bigger move - Daniel Briere trade? - but I'm guessing Philly isn't going to blow up the team at this point. 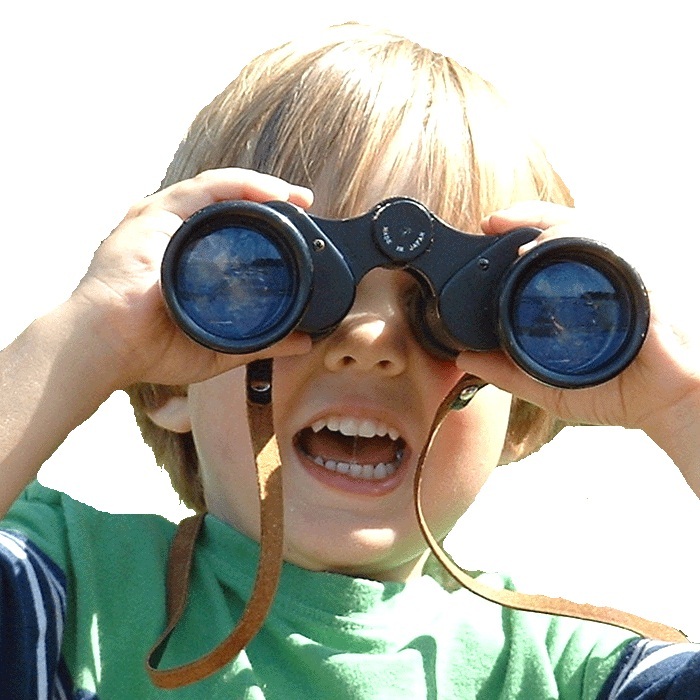 Then again, who predicted that both Jeff Carter and Mike Richards wouldn't be in Philly long-term? It could be an interesting run to the trade deadline for the Flyers. The Montreal Canadiens and Dallas Stars came together for a swap of wingers today as Montreal sent Erik Cole to the Stars for Michael Ryder and a third-round pick. Ryder should fit in nicely in Montreal as a scoring winger, and the cap relief he brings in relation to Cole will give the Canadiens some flexibility going forward. David Desharnais is a free agent at the end of this season, and you have to believe that GM Marc Bergevin will do everything he can to re-sign him. In Erik Cole, the Stars get a little grittier. Cole's time in Montreal didn't really pan out as a scoring forward, so his move to Dallas where he can play with less pressure on him should allow for him to be more effective. While I'm not sure why the Stars continue to add payroll, they should have a solid lineup of wingers when Ray Whitney returns from injury. Dallas could be dangerous down the stretch if and when they get healthy. Tomorrow, I'll take a look at the proposed NHL realignment, and I'll have my thoughts about how the playoffs will change if this realignment plan goes forward. What I will say in terms of previewing that article is that we could see those nasty, hate-filled rivalries between teams begin to develop again. That, as you're probably aware, is good for hockey. With the frequency that AHL teams change locales, I'm surprised that the AHL hasn't bought a moving company in order to reduce costs. If the AHL isn't interested in buying a moving company, perhaps the Calgary Flames are. The Flames have had their AHL franchise in Omaha, Nebraska and Moline, Illinois with little success, and now reports have them looking to move the Abbotsford Heat to a new location as setting up in the Vancouver Canucks' backyard has proven to be a money-losing venture. There was no doubt that the Heat were fighting an uphill battle upon their founding. They play in Abbotsford, BC, putting them two timezones away from their nearest competition - the Manitoba Moose - at the time of their founding. With the Moose moving to St. John's upon the arrival of the Atlanta Thrashers as the new Winnipeg Jets, the Heat would find their closest AHL rival as the Milwaukee Admirals. The distance between those two cities? 3385 kilometers or 2103 miles! Clearly, the west coast experiment for the AHL is dead. Attendance has never been great for the Flames-affiliated Heat as they play in rival Canucks country, and they sit as the 26th-best team in attendance this season. The travel is ridiculous, to put it mildly, and the team has not posted a money-earning season since it set up shop in the BC lower mainland. In short, this was a mistake. We have been approached by representatives in Utica concerning an opportunity for the AHL. We understand they are building a case for the AHL to return there. We are under contract and committed to Abbotsford, and have made no alternate commitments. Honestly, that's pretty ballsy when you consider that the Flames and Heat are in the third year of a ten-year commitment to the Abbotsford Entertainment and Sports Centre. You point out that Utica, New York has approached you, but are committed to Abbotsford? Why issue a statement at all? Why would the Flames be looking for trouble? Well, this all seems to be a little "cart before the horse" hearsay. 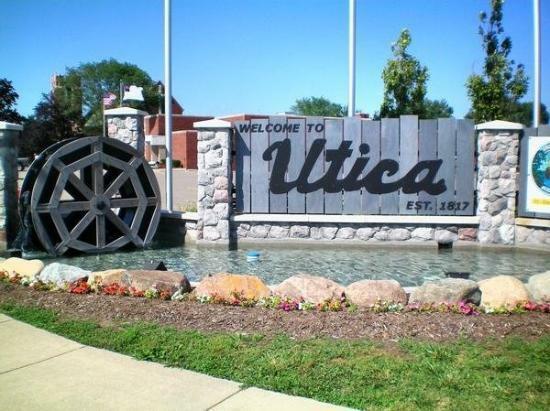 According to Utica Observer-Dispatch sports editor Matthew Becker via The Province's John Colebourn, there is nothing definite at this point for Utica in any way. "The mayor is knee-deep in the negotiations. and there is nothing definite yet," he said. "It is still in talks. We are not at the stage where a team is officially coming to Utica." So with nothing happening on the moving front today, all eyes will be on the future of the Heat as the Flames seemingly continue to listen to offers. Personally, it might be smarter for the Canucks and Flames to trade affiliates, allowing the Canucks' prospects to play in Abbotsford while the Flames' prospects relocate to Chicago. In any case, the Flames-controlled Heat will remain for the foreseeable future in Abbotsford while Utica will try to entice some NHL team to invest in their city at some point. And the world continues to turn. Speaking about spinning, if you missed the Adirondack Phantoms game on Sunday, consider yourself lucky due to the head-spinning uniforms they decided to wear for their match against the Binghamton Senators. Apparently, it was the birthday of Dax, their mascot, and they honored him as any minor-pro team would: they wore his face on their chests. Yes, you read that correctly. Seriously. I'll let Shaquille O'Neal describe these uniforms in terms of their graphical image. I'm pretty sure that the Phantoms' 2-1 win was less about how they played and more about Binghamton being distracted by these horri-awful uniforms. I'd like to say that the post-game auction for these jerseys was good, but I'm not sure I want to inflict these uniforms on any fan, let alone an auction winner. I'm pretty certain this is the first time I've ever seen a jersey dedicated to a mascot's birthday, so we can mark this as a first in professional hockey. It's not a proud moment for hockey, but it's a moment nonetheless. We'll just leave it at that. I had the privilege of watching some excellent hockey played by some of the best young ladies that Canada has to offer this weekend as I attended the 2013 Female World Sport School Challenge at MTS IcePlex in Winnipeg. If last weekend's Scotiabank Girls Hockeyfest was a good starting point for the next Olympians, these women are definitely on the track to represent Canada at some point in the future. There was a ton of skill and talent on display all weekend, and HBIC is proud to have been at the event to see some excellent hockey! The round-robin was played over Thursday and Friday as the eight teams worked their way through the tournament. Group A saw Okanagan Hockey Academy from Penticton, BC take top spot with eight points. Edge School For Athletes from Calgary, Alberta finished with seven points, St. Mary's Academy from Winnipeg, Manitoba finished in third-place, and Fort Frances High School from Fort Frances, Ontario finished in fourth. Group B saw the Pursuit of Excellence Hockey Academy from Kelowna, BC land in top spot with a perfect record. Shaftesbury High School of Winnipeg, Manitoba ended up in second-place in the group. Rothesay Netherwood School of Rothesay, New Brunswick grabbed third-place while Banff Hockey Academy finished fourth in Group B. With the standings set, the top four teams would play off in a 1-vs-2 crossover to determine which teams would play in the gold medal and bronze medal games on Saturday, while the third-place teams from each group would play for fifth-place and the fourth-place teams in each group would play for seventh-place. The Fort Frances Muskies and the Banff Hockey Academy would meet on Saturday morning for seventh-place. Banff jumped out to a quick start as they peppered Fort Frances goaltender Calie Clendenning with shots early on. That quick start paid off as Banff's Alexis Westergaard got the team on the board on the powerplay just short of six minutes in. Banff would double their lead before the first period ended as Brittany Erickson chipped a shot over Clendenning's left pad during a scramble that found the back of the net while on the powerplay again. Special teams played a large part in Banff's first period 2-0 lead. Livia Lucova would make it a three-goal for Banff lead 8:11 into the second as she beat Clendenning. If it appeared that this game might be a blow-out, things started to change midway through the second as Fort Frances found their legs. Shilo Beck used a powerplay to break the shutout as her shot found its way behind Banff goaltender Andrea McDonald, and the deficit was only 3-1. However, Alexis Westergaard killed Fort Frances' momentum by finding some room to restore the three-goal lead. And 3:26 later, Alena Fiala made it a four-goal lead as she slides a puck behind Clendenning to give Banff Hockey Academy a 5-1 lead after 40 minutes. The third period was played fairly conservatively by Banff considering their four-goal lead, but Fort Frances did chip away. 5:51 into the final frame saw Jessica Coran find twine behind McDonald, and Banff's lead was now 5-2. Banff, though, wouldn't let any other goals by, and they skated to the 5-2 victory and seventh-place in the tournament. Rothesay Netherwood School and St. Mary's Academy met up for the fifth-place game as both schools were looking to get back in the win column. The problem, however, was that St. Mary's Academy came out wth fire in their eyes, and they didn't let up. If it wasn't for Rothesay goaltender Marlene Boissonnault, the final score could have been counted by touchdowns. St. Mary's opened the scoring at 9:06 when Saige Patrick chipped a puck behind Boissonnault. They doubled the lead at 18:49 when Kelly Matarazzo's shot found twine in the Rothesay net. St. Mary's threw everything they had at Rothesay in a 16-4 shots margin. Just 5:18 into the second, Jenna Thompson's booming slapshot from the point on the powerplay settled in the net, and St. Mary's had a three-goal lead. Jordan Zacharias added another goal with a minute to play to give her three points after two periods, and St. Mary's was up 4-0 in goals and 36-7 in shots Again, Marlene Boissonnault was fantastic in keeping the walls from crumbling in on Rothesay. Randi Marcon made it 5-0 just 3:53 into the third period. Jenna Thompson added her second goal of the game at 9:44. Captain Danielle Krzyszczyk notched a powerplay goal at 12:01 to make it a 7-0 game, and there were whispers of a shutout for Annie Chipman. Those whispers, though, may have been a little early as Rothesay used a powerplay of their own to break the shutout. Brittany Carroll snapped Chipman's shutout with 6:24 to play, but the game was out of hand at that point. St. Mary's took their foot off the gas as they captured fifth-place in the tournament with a 7-1 victory. In the first semi-final game, the Shaftesbury Titans suffered a 3-0 loss to the Okanagan Hockey Academy to put them into the bronze medal game. Their competition would be the Pursuit of Excellence as they fell 6-4 to the Edge School for Athletes in the second semi-final game. Shaftesbury and POE play solid defensive hockey and have excellent goaltending, so the bronze medal game looked like it might be a low-scoring affair. Sara Besseling got the nod for the Pursuit of Excellence Hockey Academy while Rachel Dyck earned the start for the Shaftesbury Titans. These two teams played a great game with a fast pace. Both goaltenders were sensational in protecting their nets, and the scoring was, as expected, low. Neither team recorded a goal through the first 40 minutes, but Shaftesbury had been getting pucks to the net as they led in shots by a 15-7 advantage. It looked as though we might have a chance at a goal as Pursuit of Excellence's Sarah Potomak was hauled down on a breakaway. The puck went back to center ice, and Potomak was granted the penalty shot! Potomak broke in and went to the backhand, but Rachel Dyck moved with her, forcing her to try to spin to the forehand to put the puck past Dyck. It wasn't to be, though, as Dyck held her ground and the scoreless tie carried on. Just minutes later with Michela Esposito in the penalty box, Pursuit of Excellence finally found a way past Rachel Dyck. Halli Krzyzaniak's point shot with a pile of traffic in front hit twine, and Pursuit of Excellence was up 1-0 with 8:29 to play. With time against them, Shaftesbury mounted a furious attack, including pulling Rachel Dyck with two minutes to play, as they looked to score the equalizer. Sara Besseling denied all shots thrown at her, though, and the final buzzer would give Besseling the shutout and, more importantly, the Pursuit of Excellence would claim the bronze medal! The gold medal game would feature the highest scoring team in the Edge School for Athletes looking to avenge their round-robin shootout loss to the Okanagan Hockey Academy. These two teams play excellent transition hockey, moving the puck well and capitalizing on the mistakes made by their opposition. Based on how close their first game was, it was expected that these two teams would be separated by a goal at the final buzzer as they matched up fairly evenly. One team would skate off the ice with silver medals while the other would bask in the glory of a championship! Surprisingly, special teams played a big part in this game as Okanagan found out. Alyssa Erickson and Hannah Miller were in the box when Daria O'Neill scored on the 5-on-3 powerplay at 4:49 to put Edge up 1-0. Just 28 seconds later, Alex Serpico fired a shot past Okanagan Hockey Academy goaltender Hayley Dowling, and Edge was up 2-0 very quickly. Edge goaltender Emma Pincott would ensure that score held true through the remainder of the period. It could have been a larger deficit had it not been for Hayley Dowling in that period as she saved nine of eleven shots fired her way. The second period saw the rough play of the first period carry over as there were seven more penalties called and one more powerplay goal. The first goal of the second period, though, came at even-strength as Emily Monaghan gave Edge a 3-0 lead at 12:19. But a slashing penalty to Celine van der Molen at 18:15 sent Okanagan to the powerplay, and they would make it count. Alexa Ranahan's shot found a gap through Emma Pincott, and the powerplay goal with 31 seconds in the middle frame would send the teams to the dressing rooms with Edge leading 3-1. Both teams came out in the third period and played tentatively which didn't make sense considering Okanagan trailed by two goals. Okanagan, though, would press with five minutes to play, and they were rewarded at 17:04 when Hannah Miller fired a goal past Pincott. Okanagan needed one more goal in the final three minutes to tie the game up, so they played the odds and pulled the goalie. The pressure worked as they pinned Edge in their own zone for over two minutes, but Edge caught a break when Karly Heffernan hit the empty net with 53 seconds to play to put Edge up 4-2. Still needing goals, Okanagan left the net empty, and Edge iced the game 29 seconds later when Cassandra Vilgrain added another empty-net goal. Edge skated to the 5-2 win to capture the gold medal at the first Female World Sport School Challenge! The tournament All-Star trophies were handed out by Mark Chipman, owner of the Winnipeg Jets, as the following girls were recognized for their great play throughout the tournament. To the victors go the spoils, and the Edge School for Athletes are the winners of the first Female World Sport School Challenge! With the victory, they'll be able to hang the banner in their arena and they can display the championship trophy in their trophy case! A quick skate around the rink as they hoist their trophy drew a lot of cheers from the crowd as the girls celebrated, and the ladies finally got down to business as they showed off their golden wares. In a rather cool moment, Karly Heffernan was told her #23 jersey would be collected for display at the Hockey Hall of Fame! How awesome is that?!? Congratulations to all the girls who participated in the first Female World Sport School Challenge. All of you should be proud for the exceptional display of hockey put on this weekend, and while there can only be one winner, everyone collectively made this first Female World Sport School Challenge extremely special. I do want to thank the tournament volunteers who helped me out when I was lost and guided me back to the right path. They were invaluable, and they deserve a little recognition as well. I also want to thank Kevin Bathurst for setting me up with media credentials so I could witness the exceptional hockey being played by these eight teams. Thank you, Kevin, for allowing a little radio station like UMFM the chance to attend this prestigious event. Finally, a big congratulations goes out to Edge School for Athletes from Calgary, Alberta - your 2013 Female World Sport School Challenge champions! There's something about seeing the joy on a child's face when he or she meets an idol. Last weekend, a number of young girls had the opportunity to meet Sami Jo Small as she ran them through the paces at Scotiabank Girls Hockeyfest at MTS IcePlex in Winnipeg. I have not seen so many smiling faces and happy children in a long time, and Sami Jo Small made sure that the smiles lasted the entire day with her infectious positivity and unbridled enthusiasm. In short, it was a pretty great day. It was an early morning as players began rolling in at 7:30 in the morning for registration for the 8:30 event. The red team started on the ice with Sami Jo early in the morning, and the pink squad followed after them. There was some off-ice training that happened at the Total Hockey Training Centre that included having teammates help their teammates in navigating a “puck minefield”. The goaltenders were given their own session with Olympic goaltending great Sami Jo Small and the instructors, and there was a classroom session for each of the groups as well. All in all, it was a busy day, but it appeared the kids loved their time on the ice with their Olympic hero. If there was one thing that impressed me most about the event, it had to be the excellent coaching provided by Hockey Manitoba staff and players. A number of women from the Manitoba Women's Junior Hockey League were on-hand to help players through the drills, and Hockey Manitoba showed their commitment to excellence by stressing fundamentals and skills in terms of helping the young girls build a solid hockey foundation. If this commitment continues, Manitoba should be sending larger contingents of hockey players to Hockey Canada women's camps than in the past. Over lunch, the younger ladies got a break, and that allowed the women of the Manitoba Women's Junior Hockey League to showcase their talents in a skills competition! The ladies showed speed, accuracy, puck-handling, and some incredible overall skill throughout the showcase. The goaltenders, however, were nearly unbeatable as they stoned shooter after shooter though the shootout, and were only beaten a couple of times in the side-by-side relay drill. Needless to say, these women showed why they are on Hockey Manitoba's radar – they were excellent, and they showed a ton of skill in the event! Having worked the Philadelphia-Montreal game the night before with CBC's Hockey Night In Canada, Cassie Campbell-Pascall didn't make it into Winnipeg until noon. Her arrival at MTS IcePlex was greeted with much cheering as the only woman to captain a team to two Olympic gold medals in women's ice hockey was finally part of Scotiabank Girls Hockeyfest in Winnipeg! Both Sami Jo Small and Cassie gave some great speeches to the girls about following one's dreams and not letting others take those dreams away. Both ladies stuck around and signed everything put in front of them by their young fans despite their attendance being needed at an afternoon coaching clinic. I cannot stress how courteous and gracious these two women were, and that is the type of person all of the girls at Scotiabank Girls Hockeyfest should aspire to be. One of the coolest things that I've seen was the 120-degree photo opportunity, essentially creating hockey cards of the girls as they were captured mid-shot. Each player was given a barcode that they wore on their helmets, and the photographers were able to attach the 120-degree image to the player's registration. The girls could then go to the Hockeyfest website and download the image of themselves for their own use. Honestly, this was some cool technology, and it appeared the girls were enjoying themselves in the spotlight. At the end of the day, Scotiabank Girls Hockeyfest was an absolute success if you base the conditions on how much fun the girls had over the course of the event. If you have a daughter, this is an event I must recommend you have her attend. She will gain a ton of hockey knowledge and skill, and most likely develop a few new friends along the way. I want to thank Sheena Findlay, the Assistant Manager of Canadian Media Communications for Scotiabank, for her assistance in not only getting me into Scotiabank Girls Hockeyfest so I could bring you a first-hand report on the event, but for putting us in touch with Sami Jo Small for The Hockey Show and for her advice and information on the event. She's a top-notch individual and I cannot thank her enough for her help. Thanks again, Sheena! Make sure you check out Scotiabank Girls Hockeyfest when it comes to an arena near you! Tomorrow, I'll have an update from a Hockey Canada event as the bronze medal and gold medal games from the 2013 Female World Sport School Challenge take place! See you then! 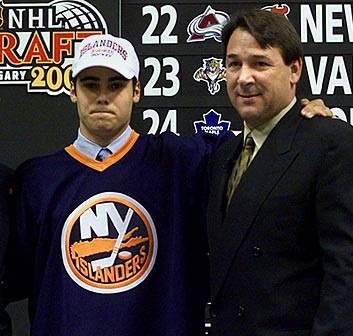 I'm not sure there has ever been a first-overall pick from any draft whose stock has plummeted more than Rick DiPietro's stock has. You could make a case for Patrik Stefan, but at least he played a few games in the NHL after being discarded by the team that drafted him. Rick DiPietro, though, was placed on waivers today with the intention of sending him down to the AHL's Bridgeport Sound Tigers if no team grabbed him off the waiver wire. As expected, none did. So the former first-overall pick will continue to be paid a handsome sum by the Islanders to tend net for their AHL affiliate as he works towards recapturing an NHL roster next season. It appeared that Mike Milbury and the Islanders were prepared to put all of their eggs into DiPietro's basket after trading away Roberto Luongo to give DiPietro the starting role on Long Island. The Boston University star came into training camp full of confidence in terms of trying to win the starter's spot in his rookie season, but he suffered a setback almost immediately as his Islanders career started. He pulled a groin muscle during his first practice in full pads, causing him to miss four preseason games, and was subsequently sent to the AHL's Chicago Wolves to get some work. After playing for the US World Junior team, DiPietro is called up by the Islanders from Chicago for the third time, much to the happiness of veteran Wolves goalie Wendell Young. Young tells Sports Illustrated's Michael Farber, "Ricky's going to need two seats on that plane: one in coach for his body and one in first class for his ego." While he may have been good, his brash confidence may have rubbed a few the wrong way. In his first Wolves exhibition game, he started a 5-1 victory over the Manitoba Moose, but didn't finish it. 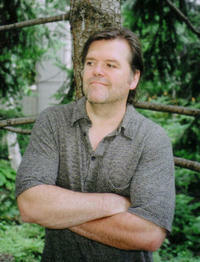 DiPietro was excused from the October 2, 2000 game after brawling with Moose goalie Stanley Reddick. "I have three kids," Dan Plante, a 29-year-old right wing who played 159 NHL games told Farber. "A four-year-old boy, a five-month-old girl and Ricky." DiPietro would finally find the blue paint in the Islanders' zone on January 27, 2001 for his first NHL game. He would record the loss in a 2-1 game against the Buffalo Sabres, but picks up his first NHL assist. He would remain with the Islanders for the remainder of the season, appearing in 20 games while posting a 3-15-1 record with a 3.49 GAA. The Islanders would finish last in the NHL that season. DiPietro had nowhere to go but up. It would take seven starts, but DiPietro would record his first NHL win on February 16, 2001 in a 4-2 over the Edmonton Oilers. The 2001-02 season saw DiPietro start the season in Bridgeport as the Islanders opted to keep veterans Chris Osgood and Garth Snow as their netminders. It appears the stint in the AHL does wonders for DiPietro's confidence in adjusting to the pro game as he leads the AHL in wins with 30, and posts an excellent 2.32 GAA and .913 save percentage. The 2002-03 season would start the same as DiPietro was platooned behind Osgood and Snow, meaning he started the season in Bridgeport once again. He was recalled from Bridgeport where he was selected to the AHL All-Star Game after playing well, and proceeds to post a 2-5-2 record with a 2.97 GAA and an .894 save percentage in ten games with the Islanders. The Isles would make the playoffs, but fall in five games to the Ottawa Senators in the opening round. DiPietro would play fifteen minutes in Game Two and would not be the goaltender of record in that game. It appears the Rick DiPietro show was here to stay in 2003-04 as he and Garth Snow form the Islanders' goaltending tandem. DiPietro posts his first NHL shutout in a 6-0 win over Buffalo on October 12, and things were looking up. However, after struggling mightily through the month of December, DiPietro requests a demotion to the AHL. He plays well in Bridgeport and returns to Long Island where he promptly outplays Snow and becomes the Isles' starter. DiPietro would finish the season 23-18-5 with a 2.36 GAA, and help the Islanders earn the eighth-seed in the Eastern Conference. They would fall in five games, and it was announced after the playoff series that DiPietro would require arthroscopic surgery on his left knee. With the lockout taking over the 2004-05 season, DiPietro accepts an invite to play with Team USA at the World Hockey Championships in Vienna and Innsbruck, Austria. Despite playing well as the team's starter, Team USA would fall in the quarterfinals at the hands of the eventual gold medal winners, the Czech Republic, by a 3-2 score. The 2005-06 season saw DiPietro play his best hockey yet. DiPietro compiled a 30-24-0-5 record with a 3.02 GAA and a .900 save percentage, including a league-best eight shootout wins, but the Islanders would miss the playoffs. 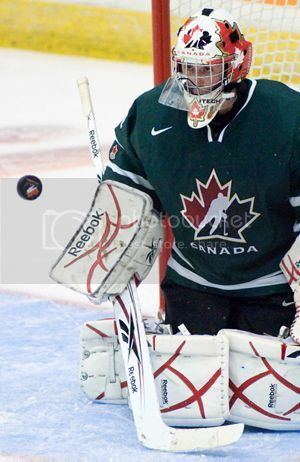 DiPietro's year also included a starting netminder role for the American squad at the Torino Winter Olympics. He played well on the larger ice in Italy, but the Americans faltered and DiPietro left Italy with a 1-3 record and no opportunity to play for a medal as Finland bounced the USA by a 4-3 score in the quarterfinals. However, DiPietro's game was getting stronger, and it appeared he was turning a corner in becoming an elite goaltender. The 2006-07 season starts with DiPietro signing a monster 15-year, $67.5 million contract. The statement made at the time by GM Garth Snow is almost comedic if not so ironic: "It's a great deal for the team because we get a flexible number that we can work with and add players as we need, it's a great deal for Ricky because he has term, and the big bonus is for our fans because they get to see a player that everyone loves for many more years to come." DiPietro plays well throughout the season, becoming the first Islanders goaltender to record back-to-back 30-win campaigns. His 32-19-9 record had the Islanders on track to earn a playoff berth, but a collision with Montreal's Steve Begin results in a concussion for the Islanders' netminder. He missed the final seven regular season games, but returned for a playoff date with the Buffalo Sabres. He didn't seem like the same goaltender, though, as the Isles fell to Buffalo in five games. The 2007-08 season began to show some of the wear-and-tear that DiPietro was suffering. Despite playing in more than 60 games again, he has off-season surgery on a torn labrum in his hip, a knee sprain in December during pregame warm-ups, and tweaks his hip again during his first NHL All-Star Skills Competition in Atlanta which would require season-ending surgery with nine games to play in the campaign. He still posted impressive numbers despite the ailments: 28-28-0-7, a 2.82 GAA, and a .902 save percentage while being selected to his first NHL All-Star Game. The Isles, however, finish last in the Atlantic Division and miss the playoffs. The 2008-09 season saw another off-season surgery before the campaign started as DiPietro's left knee was under the knife again. He logs one period in the team's first five games before undergoing an arthroscopic procedure on the same knee on November 27, 2008 that causes him to miss the next 27 games. Swelling in the knee prevents him from playing regularly, and he decides to sit out the remaining 41 games. His total appearances in the '08-09 season is five games, posting a 1-3-0 record with a 3.52 GAA. More off-season surgery to the left knee causes DiPietro to miss the first 27 games of the 2009-10 season. His first game back is January 9, 2010 where he takes a 4-3 loss against Dallas, but his left knee doesn't swell, giving the Islanders and Rick DiPietro hope that their star goaltender will make a triumphant return. The swelling, however, returns after a March 6 game, and DiPietro misses the remaining 12 games of the season as the Islanders miss the playoffs again. Appearing in only eight games, DiPietro goes 2-5-0 with a 2.60 GAA and a .900 save percentage - solid numbers considering his changed goaltending style to help his ailing knee. The 2010-11 season starts well for the beleaguered goalie as DiPietro goes 2-0-2, but the swelling in the knee returns on December 22, forcing DiPietro to miss the next three games. Upon his return, he pulls his groin in a January 3 game against Calgary, shelving him for another five games. DiPietro earns the start against the Pittsburgh Penguins on February 2, and he sees nothing but stars after he and Brent Johnson tangle during a melee. A fractured cheekbone had DiPietro on the mend for another twenty games. As baffling as it seems, DiPietro actually led the Islanders in appearances with 26, posting a record of 8-14-4, a 3.44 GAA and a .886 save percentage. For as good as DiPietro once was, he was living up to his moniker of "Rickety DiPietro" as he failed to once again reach 30 games played, let alone a 30-win season. The 2011-12 season saw DiPietro begin the season on the ice, but was quickly back on the injured list as a puck to the mask in practice on October 12 resulted in a concussion that caused him to miss three games with concussion symptoms. He would finally return to the Islanders net for a December 3 game against the Dallas Stars, but tweaked his groin once again. He is on the disabled list for almost a month with this tweak, but wouldn't make it off as the Islanders announced on January 14, 2012 that DiPietro has a sports hernia requiring surgery. This new turn-of-events sidelines him for ten weeks. His season was over once again. During the past four years, DiPietro appeared in just 47 of a possible 328 Islanders games. Of those 47 games, he won just 14, resulting in a winning percentage of .298. Factoring in that he pulled down approximately $18 million during those four years, DiPietro's wins are costing the Islanders approximately $1.2 million per win. With eight years and $36 million remaining on the contract, that's a hefty price tag for a goaltender. Sending DiPietro down to Bridgeport at this point in his career is practically charity. His 0-3-0 record, 4.09 GAA, and .855 save percentage is horrible, and there's absolutely no way one can justify his salary at this point. Much like the Rangers did with Wade Redden, Rick DiPietro's career in the NHL will hinge almost entirely on a buyout or a miraculous turn-around in his play. If you're a betting man, the former is where you're putting your money. While I'm not here to celebrate the downfall of a goaltender, it's almost tragic how Rick DiPietro's career has played out thus far. I'd like to believe that he'll turn his career around and play some spectacular hockey in Bridgeport that will allow him to regain a roster spot with the Islanders next season. I'd also like to believe that DiPietro won't suffer further injuries that won't prevent him from playing more than a dozen games. What's that old saying - "if you believe that, I have swamp land Florida to sell you"? Someone get me a real estate agent. The Hockey Showis back on the air on 101.5 UMFM tonight at 6pm where we'll be chatting about a ton of stuff from the hockey world. The Manitoba Bisons men's team is off to Saskatoon this weekend for a couple of Canada West playoff games against the Saskatchewan Huskies, the Jets finally won a game, Lindy Ruff was dismissed as the coach of the Buffalo Sabres, and we'll talk about the Scotiabank Girls Hockeyfest that happened last week that I attended! We'll be taking calls at (204) 269-8636 tonight as we discuss all the happenings in hockey, and we want your views too! Call us, tweet me at @TeebzHBIC, or email us at HockeyShowUMFM@shaw.ca, and we'll answer any and all questions that come our way! I know people in Winnipeg want to talk about the Jets, so feel free to call us up and have your take on the air! Tune in tonight, and there may even be a prize or two for a lucky listener! I've been restocking the shwag bag slowly, and we have some decent gear to give away. If you're under the age of 12, we have some kids-sized prizes too! If you want to call in, get your parents' permission and then give us a buzz so we can talk hockey with you! It should be a great show, so tune into The Hockey Show tonight on 101.5 UMFM at 6pm! I have had the privilege of meeting hockey legend Bobby Hull in my life, and I found the man fascinating in the short time I spoke with him. He had stories and tales that he told one after another, making him quite the entertainer for the few minutes I spent in his presence. Today, Teebz's Book Club is proud to present a book that focuses on Bobby Hull in The Devil And Bobby Hull, written by Gare Joyce and published by John Wiley & Sons, Ltd. In having met Bobby Hull and heard the tales of him in and around Winnipeg, there was always a larger-than-life aura that seemed to encompass him. Mr. Joyce's look at Bobby Hull's career and his struggles behind the scenes that led him down the dark path in becoming hockey's lost legend. Gare Joyce is a writer for ESPN The Magazine. He is a regular contributor to several national publications as well, such as Christian Science Monitor, Canadian Geographic, Maclean’s, and The Walrus. You can find him writing for Sportsnet.ca where he routinely covers junior hockey in Canada. He was won three National Magazine Awards, and has several other books that have been published, including Future Greats and Heartbreaks and When The Lights Went Out that have been reviewed on this site as well. I expected the story contained within the covers of The Devil And Bobby Hull to be about how Hull's jump to the WHA led to his banishment from the hockey spotlight, but little did I know that Mr. Joyce would cover that portion of Hull's story and a whole lot more. When you begin down the rabbit hole that is Bobby Hull's life, you discover that it wasn't as glamorous and exciting as much as Bobby Hull lets on, and is, in fact, quite horrible when you consider the picture that Mr. Joyce paints. Each chapter starts with Mr. Joyce and Bobby Hull sitting in a popular hockey-themed restaurant in Toronto where Hull is talking about his career with Mr. Joyce. I found that starting the chapters in this fashion really set the tone for the rest of the chapter, and, as the book progresses, the dark clouds begin to fill the picture as Mr. Joyce paints it. From his battles with the Wirtzes to the jump to the WHA to the snub on the Summit Series team, Mr. Joyce really digs into these wounds and looks at why these events happened. Needless to say, he finds a lot of information about why things happened the way they did while Bobby Hull claims he's a victim of the system. Mr. Joyce makes it clear that there is more to the story than "woe is me". Mr. Joyce does some exceptional work in bringing to light the domestic issues going on behind the scenes in Hull's world and how these issues affected both his on-ice play and his career. His final days in Winnipeg resulting in a trade to Hartford came about through a stunning turn of events, and it is almost unbelievable how his career mirrors his personal life. Mr. Joyce does an excellent job in bringing forth this aspect in the later chapters, and he should be commended for his research and effort to show how Hull's career wound down at precisely the same time his marriage was falling apart. It's uncanny! Everyone behind the scenes knew exactly why Hull had been away from the team and why he had announced his retirement. Everybody knew that it was Joanne and the marriage. Mr. Joyce paints Hull as a man who absorbed a lot of physical and emotional pain from his days in hockey that has resulted in his anger towards certain factions of the hockey world. Sadly, the long-held image of Bobby Hull being the fun-loving, exuberant hockey legend is far from how he is portrayed in The Devil And Bobby Hull. At first, it seemed as though Mr. Joyce was quite negative in his views on Hull, but it becomes increasingly clear that Hull sees his life through rose-colored glasses when a dose of reality would do him good. Always the victim, Hull was ostracized, black-listed, and kept out of the NHL by a number of factors and men, all of whom conspired to ruin Hull's chance to be the best hockey player the world has ever seen. You get the sense, though, that this "coulda, woulda, shoulda" chatter has been practiced and polished one time too many for those that know the history of Bobby Hull. 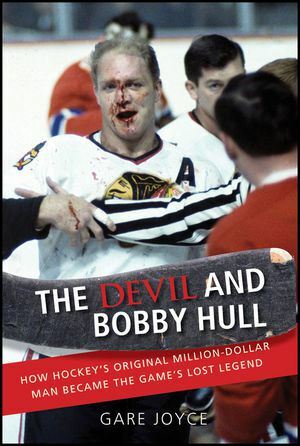 The Devil And Bobby Hull is a fantastic book that does have a little colorful language splashed throughout its 266 pages. It's an interesting read, though, as you learn that appearances are not all they may appear to be with superstars. From his battles with hockey's establishments to his failing marriage to his lack of communication with his kids, Bobby Hull has literally lost a lot more than he gained from his life in hockey. While he stood on the shoulders of men as a young man with the booming slapshot in Chicago, The Devil And Bobby Hull goes to show that even the most glitzy stars are not without their tarnish. Because of this, The Devil And Bobby Hull absolutely deserves the Teebz's Book Club Seal of Approval! It's becoming increasingly hard to watch the Winnipeg Jets play hockey this season. Andrew Ladd may have spoken about the lack of heart on this team a few days ago, but there has been little that has changed on the ice when it comes to how the Jets approach games. There's a lack of hustle, a lack of winning battles for pucks, and certainly a lack of going to the high-traffic areas on the ice where a lot of "garbage goals" are scored. But when you're a struggling team, those are the places where you have to start going to earn those goals. They aren't given, but rather they are earned. If there is one team in particular that needs to start earning a few of those goals in order to open some space on the ice, the Winnipeg Jets are it. I will admit that I have been particularly harsh towards the Jets this season, but watching the second iteration struggle worse than the original, low-budget Jets did is difficult when you consider what kind of team is being put on the ice. There's very little heart, no character, and a serious void where leadership should be. Andrew Ladd can speak out all he wants, but until there is a change in the way this team plays the game on the ice, his words mean very little and are seemingly respected by his teammates even less. Consider the following: as of today, the Jets find themselves tied with Washington in terms of points for the basement spot in the Eastern Conference. Two weeks ago, they were in seventh-place in the conference and looking upwards after a hard-fought 1-0 win over the Ottawa Senators. The pieces on this team that were supposed to perform are not. The Jets' leading scorer is currently on the injured reserve list as Tobias Enstrom's 13 points are good for 48th-best in the NHL. Andrew Ladd, the captain of the Jets, is actually performing well as he has seven goals and five assists, but where are the rest of the performers who are supposed to be carrying the bulk of the offensive load? Without further adieu, here are the quarter-season progress reports of the team that occupies MTS Centre in Winnipeg. Some will not be kind. Nikolai Antropov: I'm not sure if he's the second-coming of Sergei Bautin, but he moves like he's never been on skates before and has zero awareness of what's happening around him. So in short, he could be Sergei Bautin. I'm not even sure Antropov ever played hockey based upon his play over the last two seasons. Someone needs to find out if there's a KHL team that will take him. Otherwise, get him an orange jersey. He's a pylon. Alexander Burmistrov: He looks like he's going to be a solid forward if the Jets can ever find him two wingers that skate better than Wellwood and Antropov. Honestly, every time those three come over the boards, I wonder how much Claude Noel dislikes Burmistrov. It's the only explanation as to why he keeps putting a speedy playmaker like Burmistrov with a pair of pylons. Olli Jokinen: If anyone needed proof as to why Jokinen has only made the playoffs once in his fifteen-year career, this season should sum it up nicely. He was supposed to bring leadership and a veteran presence while providing scoring and play-making, but I'm pretty sure the Jets could have pulled Thomas Steen out of retirement to match Jokinen's production thus far. Jokinen is trade bait at the deadline for anyone who wants to toss a bag of pucks back at the Jets. 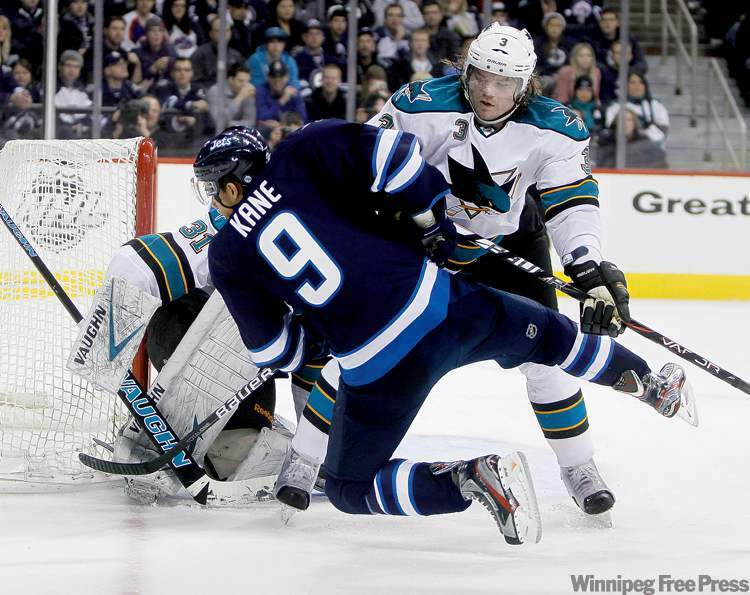 Evander Kane: Stop worrying about race relations via Twitter, and start going hard to the net. You want to be a one-timing weapon like Stamkos or Ovechkin, but players are camping out on you. Power forwards score lots of goals by going to the net and they open up space for themselves because defencemen can't play you one-dimensionally. You scored against Boston by standing in front of the net. Here's an idea: GO TO THE NET! Andrew Ladd: I appreciate Ladd calling out the team in terms of their poor play, but let's be honest here. Ladd is a third-line forward at best on any other team other than Winnipeg. Sure, he can be the captain as a third-liner, but he won two Stanley Cups as a role player and nothing more. Expecting him to score 60 points and carrying the offence is a pipe dream. Bryan Little: He looked like a superstar when paired with Ilya Kovalchuk, and hasn't really done much since then. I get that Little is more of a playmaker, but he's not even doing that with any regularity. Little, like Kane, needs to head to the net more often, almost in a Daniel Briere-like fashion. There are goals to be had if Little is willing to get his nose bloodied a little more often. Antti Miettinen: He's still on the roster? What kind of injury does he have where he hasn't suited up once this season? And, honestly, would it matter if he did based on his play last season? Anthony Peluso: Sorry about picking you up off the waiver wire, Anthony. I know the Jets promised playing time and an opportunity and what-not, but they were so thin on the forward ranks that a team could have waived a mannequin and the Jets would have jumped at him. Unless, of course, you're Zach Boychuk. Who needs a guy like Boychuk? Anyway, keep plugging away and we'll try and get you in more than one game this season. Thanks, bud. Jim Slater: I appreciate the work that Slater has put in this season as he's been reliable on both the penalty kill and as an energy guy. Slater never seems to take a shift off, and he'll go into the corners to do the dirty work. The Jets could use a little additional offence from him, but considering his linemates, any offence is better than none at all. Eric Tangradi: The Jets could have had Zach Boychuk for nothing. Boychuk, of course, replaced Tangradi in the Penguins' lineup. So the Jets traded a seventh-round pick for a guy who lost his job to a waiver wire pickup. Seems wrong, no? In any case, Tangradi has only been here for a couple of games, but has been as consistent as he was in Pittsburgh in remaining scoreless on the season. Chris Thorburn: Thorburn is a solid fourth-line player who throws his body around when he's sent out. The problem is that he's not a fighter, and he doesn't score. Thorburn needs to decided whether he's going to be a nuisance and cause other players to take penalties or be a fighter and drop the mitts when needed. Right now, he's doing neither. Kyle Wellwood: I'm pretty sure that Kyle Wellwood's best days as a skater are past him. If Antropov was slow, Wellwood is beyond slow by a factor of ten. I'm not sure he'll crack double-digits in points this season because the play is already heading back down the ice towards the Jets' zone by the time he hits the blue line - the Jets' blue line. Molasses have been officially renamed in Latin as "Kylus Wellwoodius". He's THAT slow. I'd say trade him, but who would want him? Blake Wheeler: Wheeler, like Kane, is stuck in this public belief that he's a power forward when he plays so soft. Wheeler is the biggest body that can skate that the Jets have up front, but he too refuses to go to the high-traffic areas. Wheeler has great hands and is tough to knock off the puck, so why isn't he going to the net more often, and why isn't he standing in front of the net? For all that is good in this world, GO TO THE NET! James Wright: Wright has played 12 games with the Jets, picked up no points as a fourth-liner, but he does have 24 PIMs. Wright has shown some good hustle and he goes into the corners, but his seven shots leave me wondering why he was brought in at all. I mean, Zach Boychuk was available, and the Jets passed on him. I guess that's why I'm not the GM. Zach Bogosian: He hasn't played enough this season to warrant a poor grade, but Bogosian is one of the more reliable blueliners on this team. Here's hoping he can come back, score a few goals, and keep the puck from finding its way behind the goalies. Dustin Byfuglien: I get the sense that with all of the defencemen the Jets currently have, Byfuglien would be a better fit on one of the top two lines as a forward. After all, one normally sees Byfuglien deep in the offensive zone instead of playing his point. While his offence from the blue line is definitely a plus, he needs to be more Chris Pronger rather than Sean Pronger in his own zone. Grant Clitsome: He's been neither good nor bad when playing, so I guess that's a good sign for a defenceman. He needs to find some confidence in himself and his teammates so that he can skate with the puck because Clitsome could be a solid offensive defenceman if given the chance. However, the current Clitsome is adequate in his role. Tobias Enstrom: I appreciate what he brings to the table as the guy who makes the first pass out of the zone and quarterbacks the powerplay. Defensively, he's solid and doesn't get caught out of position often. But even Nicklas Lidstrom shot the puck once in a while Enstrom has to shoot the puck more often to open up his teammates on the powerplay. Opposing playing don't respect his shot because they know he's going to dish it to Byfuglien. SHOOT THE PUCK! Ron Hainsey: I've been very impressed with the minutes that Hainsey has been eating since Enstrom went down with his injury. Hainsey isn't flashy and won't net you a lot of points, but he's been playing solid, fundamental hockey with his increased minutes. If he can continue this type of play, he could this team's unsung player of the year. Paul Postma: He's got the big shot, and he should be using it when he can. However, for all that Postma brings to the offensive end, he has made some glaring errors in his own zone that have resulted in goals against. Postma is a work in progress after being stuck in the AHL for a long time, but he could be a good defenceman if he can reduce the number of errors that result in red lights flashing. Zach Redmond: He plays well, but has a penchant for taking dumb penalties. Redmond should be another player who can make the jump, but he needs to keep his stick down, his hands off opposing players, and continue to move his feet. If he can reduce the unnecessary penalties, Redmond could find a roster spot for a long time. Mark Stuart: He blocks shots, he logs a ton of minutes, and he drop the mittens when needed. Stuart is a warrior, and is the kind of guy coaches love to have available when they need a shutdown guy. If he could pick up a couple of points here and there, Stuart would be exactly the kind of guy the Jets would want to clone. Al Montoya: He's been a solid player when called upon, but he simply hasn't played enough to be a serviceable goalie. His 2.74 GAA is decent, but his sub-.900 save percentage won't wow anyone. Needless to say, playing in just four games has allowed rust to develop, and that isn't anything a backup goaltender needs. Ondrej Pavelec: He's far too often been the reason the Jets have won games in the past, and it's clear this season that Pavelec has to be outstanding or the Jets will not win. The problem is that he's been not outstanding for a number of games, and his 3-8-1 record, 3.14 GAA, and .889 save percentage are evidence of that. Pavelec has to be much, much better if the Jets want to see an improvement, but he's just not providing that option right now. As a result, the Jets are suffering. My favorite line that Noel keeps sending out is the Wellwood-Jokinen-Tangradi line, aka the "High Hopes" line. Those three have generated nothing but groans and moans from Jets fans, yet Noel has used them regularly through the last two games. Does no one else see how brutal those three players are when playing together? This team needs a rebuild in the worst way. I'm not sure if the Jets are hoping to win one of the top-three draft spots to land one of Seth Jones, Jonathan Drouin, or Nathan MacKinnon, but they are certainly making a run at one of those spots with their recent play. Perhaps they are secretly planning to scrap this season and they are holding their cards tight to their chest in order to keep fan interest high. But for all the Jets are doing on the ice, things are looking like status quo in terms of missing the playoffs yet again. 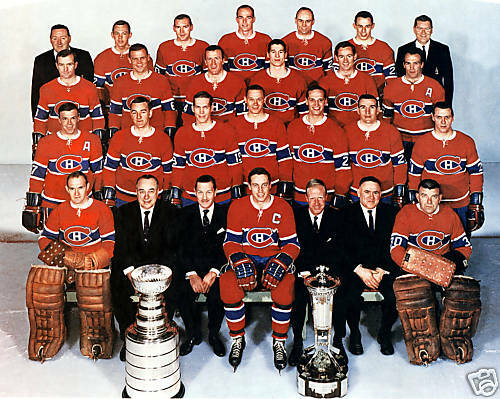 If you had to guess which team won the first Stanley Cup while being broadcast on television in color, the smart money would go on the Montreal Canadiens simply due to the vast number of Stanley Cups won in the 1960s and 1970s. 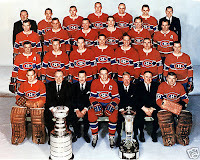 Montreal did win the first Stanley Cup while bring broadcast in color television, and they did so in 1966 over the Detroit Red Wings in six games. What was unique in the 1966 NHL Stanley Cup Playoffs is that the American teams played on blue ice throughout the playoffs! As you know, "traditional" looks of ice in hockey played around the world is white as teams use white coloring to allow the puck to stand out. The 1966 Stanley Cup Playoffs were unique in that it was the first broadcast in color television. Broadcasters forced NHL teams to do something very different from what they normally did in order to prevent oversaturation of the bright lights against the white ice. Oversaturation in white may cause the puck or the players in white uniforms to somewhat disappear on the television broadcasts, so NBC asked the American teams to change the ice surface color to blue to help the cameras out. The Montreal Canadiens reportedly started the season with blue ice to help with this oversaturation problem, but were back to using white ice shortly after the season had started. It sounds like the CBC figured out how to fix this problem early on. Normally, you'd think that there would have been testing done ad nauseum on this, but you have to remember that this is the first time anyone in the USA had thought of taking cameras inside NHL arenas for color broadcasts. The technology and know-how to prevent this oversaturation probably hadn't even been considered when color television was introduced, and no other sports broadcast would have had to deal with a white background in real-life. Rather than fixing the technology, the solution of fixing the background was put in place The 1966 NHL Stanley Cup Playoffs would be played on blue ice. Because of the six-team format, the Rangers and Bruins would sit out the post-season in the NHL in 1966. The Montreal Canadiens would dispatch the Toronto Maple Leafs in a four-game sweep to advance to the Stanley Cup Final in the all-Canadian series. The Detroit Red Wings clipped the Chicago Black Hawks 4-2 in their series, setting up the Canadiens-Red Wings Stanley Cup Final. And in that final, we see the local television broadcaster using the color television technology to show off the Olympia's sky-blue ice. While the Blackhawks and Red Wings used blue ice in their series and Detroit started with blue ice, there had to be some sort of push back from the NHL because the ice appeared white during the Game Six overtime win by the Montreal Canadiens in securing their fourteenth Stanley Cup victory. There was one game in Montreal between the two Detroit games where the blue ice appeared and the Game Six loss, so why did the ice appear so white in the following clip? If you look closely the ice and the boards are nearly the same color, and the ice near the end of the video is very bright white as the oversaturation kicks in on the video. Clearly, there had to have been white ice at the Detroit Olympia that night, meaning that the Detroit Olympia staff forgot to tint the ice while making it or NBC backed off their "blue ice" demand. In either case, it appears that the Canadiens won on white ice, making their Stanley Cup victory a little less unique than what could have been. Personally, it would have been cool to have had the Stanley Cup awarded on colored ice, but it was not to be in 1966. Just for your own personal information, I have searched the vast repository of information known as the Internet and I cannot find any events that took place at the Detroit Olympia between May 2 and May 4. Game Four was played on May 1 in Detroit and the series was tied 2-2, so there was going to be a Game Six regardless of the outcome of Game Five, meaning that the crew at the Olympia and NBC had to know the series would need a minimum of six games. Game Six was played on May 5 and the video above shows white ice, meaning that it appears someone just said "forget it". Because of this, the blue ice only lasted two games in Detroit in the Stanley Cup Final, making it a simple footnote in the league's vast history. I do want to throw out a "thank you" to Jerry Wolper who sent in this article about the blue ice to Uni Watch. Once again, the Uni Watch community has dug up some incredible information that has allowed me to head down the rabbit hole once more in search of blowing the lid off this topic. Thank you, Jerry, for reading through the old newspaper articles and finding this juicy tidbit of info! If you're looking for me today, I'm taking myself off the grid as I'll be out at an event where hundreds of excited girls and young ladies will be able to see two of their heroes in action as the Scotiabank Girls Hockeyfest takes place at the MTS IcePlex in Winnipeg! Olympians Sami Jo Small, who you may have heard on The Hockey Show on Thursday, and Cassie Campbell-Pascall will be running the participating girls through a number of drills and activities to help them on their path to becoming the next Canadian Olympic heroes and more! I have been invited to get some interviews and take some photos of the event, so HBIC will recap everything that happens today coming up this week. Further to this, The Hockey Show will have clips of the interviews done with Cassie and Sami Jo as well as some of the participants at the event. If you'd like to attend to get an autograph or see the event as it happens, I encourage you to come down to the MTS IcePlex and see the two Olympians and the next wave of Canadian women's hockey stars! I will be looking for people who are wearing their best hockey jersey of their favorite players, and I'll be awarding prizes during the day. If you don't get a prize at the event today, don't worry! The Hockey Show will be giving out some additional prizes this week as we talk about this event on Thursday's show. If you're not tuning into 101.5 UMFM for The Hockey Show, you're missing out! If you want me to find you in your favorite jersey, please tweet me at @TeebzHBIC and I'll come and find you. All pictures of people in their jerseys will run right here on HBIC, and we'll discuss some of our favorites on Thursday as well. See you at the rink today, and get ready for some fun with two of Canada's finest hockey players in Sami Joe Small and Cassie Campbell-Pascall as they run the Scotiabank Girls Hockeyfest! Because of my involvement with the UMFM radio station, I have been following the University of Manitoba Bisons hockey program all season, and both the men's and women's teams opened the Canada West Conference quarterfinals this weekend as the CIS prepares for their annual hockey tournament to decide which team is Canada's best collegiate team. The Bisons men's team went on a fantastic run to close out the season in third-place in Canada West while the women battled hard all season to a sixth-place finish. But as the old adage states, all you need is a chance, and both teams qualified for the playoffs! The Bisons men's hockey team finished the season with a respectable 17-7-4 record after starting the first few weeks of the season with a sub-.500 record. The men also finished as the seventh-ranked team in the CIS as their strong play finally saw them break into the top-ten on November 27, 2012. As they continued to pile up the wins, they moved up the standings and the rankings to finish one point behind second-place Saskatchewan, drawing them a quarterfinal match-up with the University of Regina Cougars in the three-vs-six Canada West playoff series. The Bisons had won the season series by a 3-1 margin, but the two teams split on the final weekend, causing the Bisons to miss out on that coveted second-place finish that would have afforded them a bye for the opening weekend of playoffs. While the Bisons certainly have the firepower to overwhelm the Cougars in a short series, the Cougars needed to win the opening game to put the pressure on the Bisons in the three-game series. Would the Bisons men's team continue their winning ways? In a word, yes. The Bisons played in the comfy confined of Max Bell Arena and used the home-ice advantage to jump out to a 1-0 lead in the series thanks to a 6-2 win. Jesse Deckert was busy in the Manitoba net as he stopped 35 of 37 shots, but it was the impressive first-line of the Bisons that paced them to victory. Blair Macauley had a pair of goals in a four-point night, Tyler Dittmer scored a goal and an assist, and Ian Duval has a goal and three assists as the Bisons' big guns put up four goals and ten points on the Cougars. The Bisons led 2-0 after the first period where they threw 17 shots at Cougars goaltender Lucas Gore. Manitoba was up 4-1 after 40 minutes, and closed out the game with a 2-1 advantage in goals in the third period. While Manitoba was outshot 37-35 in the game, the Bisons snipers found holes past Gore to pace them in the Game-One victory and put the squad up 1-0 in the best-of-three series. Tonight, the two teams met again at the Max Bell Center at the University of Manitoba, and the Bisons trampled the Cougars again. The Cougars decided for a change in net with the hopes that their fortunes would change, so Andrew Hayes was sent to the blue paint for Regina. Jesse Deckert would get the call again for Manitoba, and he was considerable less busy than he was on Friday. The end result is that the Bisons ended Regina's season tonight with a convincing 5-0 victory to capture the best-of-three series by a 2-0 margin. Tyler Dittmer was the man of the night as he scored four of the five goals that the Bisons put on the board. If it wasn't for Tyler Feakes' goal five minutes into the second period, Dittmer would have had himself the natural hat trick tonight. Ian Duval had three assists and Blair Macauley had another pair of assists, giving the line a ridiculous eight goals and nineteen points against the Cougars this weekend! If the Bisons' top scorers can remain this hot through the next couple of rounds, the Canada West playoffs might be over fairly quickly. Jesse Deckert recorded the 24-save shutout tonight as the Cougars were sent home with their tails between their legs. Manitoba outshot the Cougars 42-24 in the game, and were strong on the penalty kill tonight. For the series, Manitoba was 4/12 with the man-advantage and killed off seven of eight powerplay chances by the Cougars. Special teams can certainly change the outcome of a series in a hurry, and the Bisons showed that as they pumped three powerplay markers past the Cougars on Friday and another tonight. The Bisons will play the University of Saskatchewan Huskies in Rutherford Rink next weekend in the Canada West semi-finals. The two teams split the season series at 2-2 with Manitoba outscoring the Huskies 10-8 in the four games. As stated above, one point separated these two teams in the standings, so this series should be a closely-contested battle with the winner moving onto the Canada West final. Here's hoping we see two more Manitoba wins next weekend! The Bisons women's team qualified for the playoffs after 10-12-6 campaign that led them to the sixth-seed in Canada West play. They drew the impressive UBC Thunderbirds in the quarterfinals, and were looking to pull off an upset against the third-place team. Manitoba was 1-3 against UBC this year in conference play, but had only been outscored 10-6 in those games. It appeared that an upset could be in the cards if Manitoba limited their mistakes and kept the Thunderbirds in check as the Thunderbirds were opening their first playoff game ever in Canada West history. Game One went on Friday night from Father David Bauer Arena, and the game was tight early on as Manitoba and UBC were tied 1-1 through 18 minutes. As you're probably aware, though, there are 20 minutes in a period, and the wheels came off for Manitoba in the dying minutes of the first period as UBC notched two goals in the final two minutes to go into the intermission up 3-1. The Bisons played well in the second period, but a powerplay goal and another late goal in the period gave UBC a 5-1 lead. With as good as goaltender Danielle Dube was playing, Manitoba needed to stop the bleeding and find a way to generate more offence. Manitoba led in shots to that point - a margin of 18-12 - but they simply weren't generating the scoring chances they needed to win this game. The third period saw a fairly quiet game turn ugly as Manitoba's Maggie Litchfield-Medd was given a five-minute major and a game misconduct for kneeing with just over four minutes to play. UBC's Rebecca Unrau was cutting across the neutral zone when Litchfield-Medd caught Unrau with a knee-on-knee check. Unrau was helped off the ice by team trainers after lying on the ice, but it was not her knee that took the wost damage. After getting clipped, Unrau landed hard on her shoulder, and will require x-rays to see if there is any internal damage. Here's hoping there isn't, and she can be back on the ice ASAP. The final horn showed a 7-2 win for the UBC Thunderbirds, but the loss of one of their snipers might change the way this series is played from Friday on. Saturday's game might be a little rougher between the Bisons and Thunderbirds as the Thunderbirds carry a 1-0 series lead into Saturday night. Game Two went tonight from the Father David Bauer Arena again, and Rebecca Unrau was not in the lineup for the Thunderbirds. After both Manitoba goalies saw action in Friday's night game, head coach Jon Rempel decided to go with Leiette Klassen for the Game Two battle. UBC contered with Danielle Dube for her second start in this series, and you could feel the buzz about this game from the moment the ladies stepped onto the ice. The game was a very close-checking game through the first 40 minutes as the two teams weren't letting either side get quality chances. Any that were permitted were turned away by the two goaltenders who were standing tall in the nets. The powerplays, as stated earlier in terms of their importance in a short series, were unsuccessful on both sides, and we remained knotted up at 0-0 through the first and second intermissions. With twenty minutes to play, it looked like an overtime goal might end this one. Manitoba got the jump on UBC in the third period as they came out flying and were rewarded just 1:09 into the frame. Defenceman Jayden Skoleski put the Herd up 1-0 as Manitoba moved the puck well to find an open look, and the puck found twine behind Dube. We'd find ourselves squared again as Genevieve Carpenter-Boesch solved Klassen with a shot at the 7:50 mark, and the tight-checking game began once more. However, Nicole Saxvik found daylight and ripped a shot past Klassen just 31 seconds later to put UBC up 2-1, and the Thunderbirds were in the driver seat as Manitoba now had to press for an equalizer. Manitoba would be on the wrong end of another tally, this one by Haneet Parhar, with just 3:03 to play. Down 3-1, the Bisons pulled Klassen with just under two minutes to play and mounted a furious attack on the UBC zone. UBC's Genevieve Carpenter-Boesch would ice the game and the series with 1:09 to play as she deposited the puck into the vacant Manitoba net, ending the Bisons women's season with a 4-1 loss and a 2-0 series loss. The women played valiantly all season, but a lack of scoring hurt them this season as they lost nine one-goal games this year. One-goal losses will happen to teams, but even if Manitoba had rallied to tie games in three of those nine games and force overtime, those points would have moved them ahead of the Saskatchewan Huskies for fifth-place in Canada West. Nonetheless, a good season from the ladies, and they'll have this writer's support again next season! As for the men, they're off to battle the University of Saskatchewan Huskies. The Huskies will pose a a formidable threat in Saskatoon as the Huskies went 11-3-0 on home ice this season. One of those losses, however, came at the hands of the Bisons on January 4 as the Bisons took a 4-2 decision off the Huskies. The top line of the Bisons was on fire against the Regina Cougars, and they'll need to be strong against Saskatchewan goaltender Rayn Holfeld as he went 18-9 this season with a 2.74 GAA and a .905 save percentage. As the Los Angeles Kings showed last season, a hot goalie can change a series completely, so Jesse Deckert needs to continue as the top goalie thus far in the playoffs. I'm looking forward to next weekend's games! GO BISONS! Great Time For A Vacation?